This little ceramic seal pup is enchanted to wriggle and flump around like the real deal, but behind its giant eyes is a keen intellect. Once per day, the Seal of Approval can give you advantage on an insight check if you ask the question aloud and it can be answered with a “yes” or a “no”. 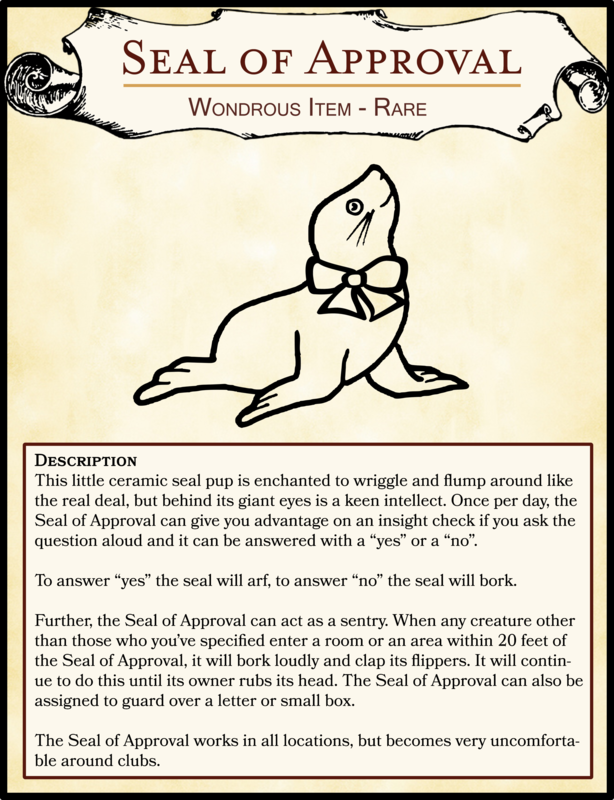 To answer “yes” the seal will arf, to answer “no” the seal will bork. Further, the Seal of Approval can act as a sentry. When any creature other than those who you’ve specified enter a room or an area within 20 feet of the Seal of Approval, it will bork loudly and clap its flippers. It will continue to do this until its owner rubs its head. The Seal of Approval can also be assigned to guard over a letter or small box. The Seal of Approval works in all locations, but becomes very uncomfortable around clubs.